Still raging against the economy? Many great minds of the past would be dismayed at the damage to people and planet being caused by our pursuit of ‘progress’. 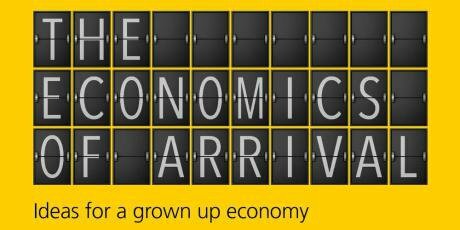 'The Economics of Arrival: Ideas for a Grown-Up Economy' by Katherine Trebeck and Jeremy Williams. Published by Policy Press. In 1890 the political economist Jean Charles de Sismondi – whose work has been described as a humanitarian protest against the dominant orthodoxy of his time – published Nouveaux Principes d’Economie Politique. This was a powerful and poetic rage against an economy focused too much on wealth and its accumulation as an end in itself. Rather than heeding his warning, that misplaced focus has become all the more acute. Of course, monetary wealth can be helpful when used thoughtfully. The last century saw unprecedented economic and social progress. From the economic crash of 1929 to the 1970s, the industrialised world enjoyed a sustained period of economic equalisation as the gap between rich and poor declined. Union rights expanded, and gender inequality fell as women stepped into new roles in society and the economy. Workers enjoyed a higher share of the global economic pie via increased labour share. Education raised skill levels, boosting job quality and remuneration. The tax system became more progressive, and a lot of the revenue was spent on social welfare. Many people in many places are richer and better educated than ever before and can look forward to longer lives. Looking at this progress, what would surely alarm de Sismondi is that so many aspects are now threatened by climate change, inequality, extremist politics, and environmental degradation. Having achieved so much, the next generation may see achievements begin to slip away. Others, who can only dream of the living standards of the rich world, find themselves shut out as competition for resources and the consequences of climate change erode economic gains as fast as development can proceed. In the rush for more, the fruits of progress risk rotting before everyone has had a chance to enjoy them. De Sismondi would also surely be dismayed at how much of this damage to people and planet is driven by the pursuit of a narrow definition of ‘progress’. In the rush for more, the fruits of progress risk rotting before everyone has had a chance to enjoy them. Many countries have more than enough material and monetary resources, but do not operate in a way that appreciates them or shares them very well. Economic inequality is higher than it has been in decades, levels of loneliness and anxiety are rising as trust in each other and in institutions is declining. In the GDP-rich world we may be living through an age of prosperity, but it doesn’t necessarily feel like it. Life feels insecure and precarious. Small victories are short lived – the iPad 4 came out just eight months after the iPad 3. Advertisers tell us that the route to wellbeing and happiness simple and just one more purchase away. Not only is this a false premise, it is an agenda that marginalises those who, even in GDP-rich countries, cannot afford to participate in consumerism. Just as de Sismondi thought when he wrote his Nouveaux Principes, today the world needs a new set of principles for the political economy. GDP-rich countries need to recognise that they have more than enough wealth and resources but are poor in terms of efforts to share and cherish them. So they have arrived in the sense of having sufficient material foundations for a good life and the priority now is to make themselves at home – a very different task from that of pursuing more and more without regard to quality or distribution. The forces acting against such a shift in gear are enormous – political success is so often measured in GDP growth and the structure of the economy itself is designed around it: in current configurations, crisis ensues without growth. Even in our minds there are barriers: the cognitive bandwidth that shapes how people think about the economy and the expectations they have of themselves have become saturated with a sense that more always equates to better. "To have failed to solve the problem of producing goods would have been to continue man [sic] in his oldest and most grievous misfortune. But to fail to see that we have solved it and fail to proceed hence to the next task would be fully as tragic." If in the rush for more society failed to notice the abundance that humanity has created, this would be tragedy enough. But there is a bigger risk. By pursuing the goals of the 19th and 20th centuries into the 21st, despite them being ostensibly met, the economic models of developed countries may begin to undo the hard work of previous generations. To abuse that abundance, and pass on a poorer future to future generations – not to mention the ongoing injustice of inequality around the world today – constitutes a huge betrayal of the opportunities and possibilities of today’s world. Katherine Trebeck and Jeremy Williams are co-authors of The Economics of Arrival: Ideas for a Grown-Up Economy, published by Policy Press.